If you haven’t checked out my new blog yet, be sure to read my “A Big Thank You & Celebration” post! You’ll also get a look at the new CTMH Art Philosophy Cricut Collection. Mine will be here soon; I can’t wait! I’m really ready to start scrapbooking my Hawaii photos and to finish some pages I’m donating to a friend who recently started chemo for bone cancer. Her son asked her to create a scrapbook for him, so my goal is to help her make his wish come true. Sharing our stories with the ones we love is so important! I don’t have kids, so I think I lose sight of that sometimes. Yet, I’m the only one who is qualified to tell my story! I’ll share the layouts that I make for her here. I’m working on the Technique Tuesday “Live in the Moment” kit by Ali Edwards right now. The inks that came with the kit are so nice; they are so chalky and smooth and look absolutely beautiful. I’m really excited about the Studio J tutorials I’ve made over the past couple of weeks. Studio J is so quick and easy, so it is perfect for beginners. Yet, it is also ideal for those of us with some digital scrapbooking experience and Photoshop skills. I’m going to start making tutorials to help advanced users get the most out of their Studio J membership, as well. Until then, here are the last three videos I created. Make sure you subscribe to my YouTube channel, createwithamy, and leave me a comment! I had a great New Year’s Eve with my husband and friends last night. We always share our goals for the new year, but this time we are finding inspiration from the one little word post by Ali Edwards. My guiding words for the year are balance and write. I want to find balance in my life so that I have more time to write! I created this layout using the new Wings kit that was uploaded to Studio J today. This paper is so beautiful. I have the classic paper kit, too, but haven’t cut into it yet. Here is a video showing how I created the journaling strips and embellished them using staples and thread from buttons. I discovered a Sketchabilities contest last night and fell for sketch #20! Even though I have a ton of school work to do, I decided that, after the stress of the past couple of weeks, I needed to relax and scrapbook. So, I’ve been working on this layout on and off throughout the day. I know the lighting on this photo is horrible, but I’m past my 10pm computer cut-off time, so I need to hustle and get to bed. I had a great time playing with my Silhouette for this layout. I purchased all the die cuts through the Silhouette store, the background paper is Scenic Route, and everything else is Close To My Heart. I resisted the urge to further embellishment; I’m trying to simplify my process. Anyway, this layout makes me happy, so that’s all that really matters! I’m not really a Halloween person. For years, Neal and I ignored the holiday, turned off the porch light, and went to a movie to avoid having candy in the house. Luckily, our house was never egged by disgruntled trick-or-treaters! Even so, I find it amusing that, for the past two years, I’ve had a Halloween stamp for the new Autumn/Winter Idea Book swap. In fact, I won 2nd place in a CTMH contest with last year’s card! Here is the card I submitted for the current swap and a little sneak peek at some of our awesome new colors! The paper I used is called Hooligans (X7129B); I love this paper! The colors are fantastic and will look great with a variety of photos, not just Halloween pictures. 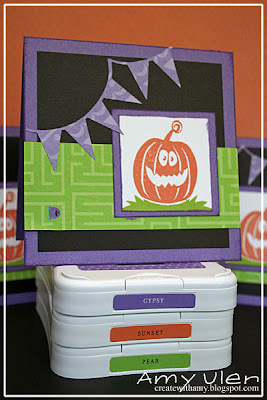 The stamp set is called The Boo Crew (C1421) and comes with 6 darling pumpkins. The new Autumn/Winter 2010 Idea Book launches September 1st, so contact me to reserve your copy! Close To My Heart’s Studio J will launch in a few months, and I can’t wait to share it with everyone I know! Since I attended Leadership, I was given early access to Studio J but have only now had a chance to play with it. I placed my first order a few minutes ago and thought I would share my LOs here. So, what the heck is Studio J?! 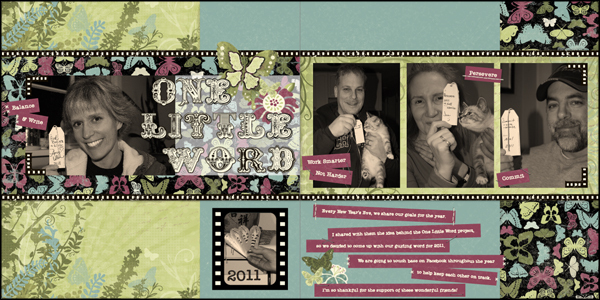 It is a FREE online scrapbooking studio. It’s like digital scrapbooking, but not nearly as time consuming, expensive, or difficult to use. You’ll be able to try the full, web-based program through my CTMH website when Studio J launches in March. Until then, enjoy this little sneak peek! Good news–if you are a digi-scrapper, you can import PNG files to drop in the photo wells like I did here with Katie Pertiet’s Postage Frame Clusters! 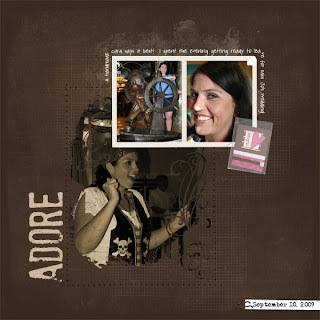 If you know nothing about digital scrapbooking, never fear…Studio J was designed just for you! The following LOs were designed in a flash; choosing my photos and writing my journaling was the longest part of the process. Wow! It’s a little embarrassing that I haven’t updated my Weekly Creativity Challenge for 3 months! It’s not that I haven’t been creative; it simply is that my blog took a backseat to school, my online classes, my CTMH club, and my sick kitties. I’m on winter break now, so I’m going to get back into the swing of posting. 9/20-26 ~ Complete the Telling Stories Deeply and the Learn Something New Every Day class prompts. Create digi LOs for Learn Something New. Although I didn’t do any of the Telling Stories lessons, I did manage 10 digi LOs for Learn Something New. I also went on a bit of a digi shopping spree. I’m technically not a digital scrapbooker, but I have purchased a ton of digi elements, papers, PDF files, Etc. over the past few months. Not really sure what that is all about other than the fact that most of the items are $.25 at Designer Digitals…LOL! Blog ~ Post digi LOs. Blog “The Great Escape” story! How is it possible that I STILL haven’t written about “The Great Escape”? Seriously! CTMH ~ Finish card kit and Twitterpated WOTG. I finished ½ the card kit and both Twitterpated LOs. I am absolutely in LOVE with those LOs and will post them during break! I have to tell you, I am absolutely shocked right now; so much so that I’m posting a quick blog during lunch at work…I never do that! 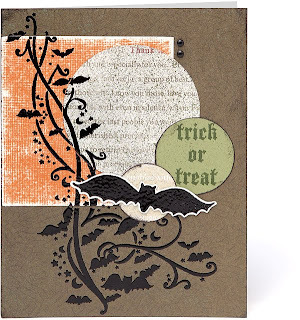 I just discovered that I won 2nd place in the August CTMH “Make it from Your Heart” Contest for the “Trick or Treat” card I submitted to a swap. I love this card, but I NEVER would have sent it in on my own. I’m very thankful that my friend, Sue Laufer, asked for an extra set of cards to enter into the contest. Now I have $50 in select product credit to spend…woo hoo!